Salted Caramel with Candied Pecans Gelato - extreme indulgence to the max!! at only 1/3 the calories of ice cream :-) Extra rich and creamy caramel flavor enhanced by natural sea salt .... then punctuated with the bright sweetness and crunchy texture of candied pecans. MUST TRY!! Mango Sorbetto - This is nothing like the usual mango ice cream. Our mango sorbet is creamy, without losing any flavor of fresh ripe mangoes! 100% fresh Philippine mangoes only. 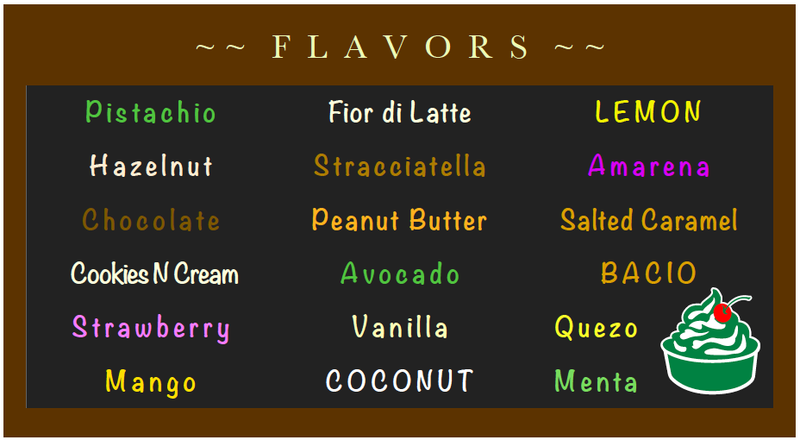 Guyabano Sorbetto - you have to try this!! Bacio Gelato - Choco-Hazelnut Gelato. Fior di Latte - This is our 'Plain Vanilla' Gelato. You can see the true quality of Gelato in this flavor. With our Fior di Latte, the natural goodness of farm fresh milk and cream really stands out! This is also one of the most popular Gelato as it is the most versatile. Add chocolate, blueberry or strawberry sauce on it and you get your favorite dessert. Add Espresso on it, and you get heavenly Affogato! Hazelnut with Chocolate Swirls- best seller. A personal favorite! Sicilian Pistachio - best seller. Pistachio Gelato is the all time Italian Gelato favorite. Chocolate Sorbet - super rich Chocolate Sorbet. For Chocoholics only. Stracciatella - best seller. A very traditional Italian favorite, you get chocolate chips mixed into Fior di Latte Gelato. Cookies n Cream - Another best seller. Generous helping of crushed Oreo cookies are incorporated into Fior di Latte Gelato for the perfect combination of Creaminess and Cookie Chocolate Crunch! Strawberry Gelato - another all time favorite! This is really double strawberry Gelato. Strawberry chunks and swirls are further incorporated into Strawberry Gelato for that extra pink goodness. Cappuccino Latte Macchiatto - Must try! Coffee with Chocolate Swirls - for coffee lovers. Yoghurt Gelato - Enjoy it with your favorite fruits! Mango, Strawberry, Blueberries, Raspberries, Kiwi Fruits - you name it! Limone - A personal favorite. Fresh and Refreshing! Nothing can be better on a hot and sunny day in the Philippines! Mint Sorbet - Super cool!